Nodding-off while reading is a common enough occurrence. 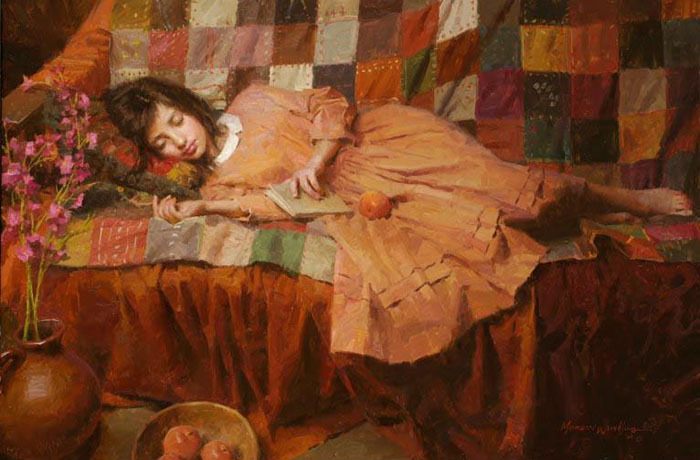 The warm-color harmonies of this soft and cozy quilt emphasize the dreamy atmosphere of this beautiful painting. The quilt itself is an authentic antique from the 1880s that Morgan was able to acquire at an auction. This work of beauty, love and peacefulness enriches the comfort and safety of any home in which it hangs.